This is a good article to provide to consumers on the difference between the World Wide Web and, well, web apps. The confusion comes from the fact that a web application, or any type of app performs some useful function. You interact with it somehow to complete some job that you need done. But now when most people hear the word app, they recall hearing the catchy phrase there's an app for that and associate that with their phone. Apps then become something that is on their phone. The train of thought required to build a web app is quite different than a web site. When building a web site, some common questions might be what information do I want to display, and what's the best way to display it? When building a web application, the questions become features. A developer will ask what does this app need to do? What are we trying to accomplish. While consumer drones are very much a reality and a hot topic at this week’s CES 2014, the biggest question on the commercial side remains mostly unanswered: What’s it really going to be like to have a drone deliver packages to your house? In other words, what will the experience truly be like? This is in reference to the Amazon video that purports to show a drone delivery service,which really is more of an advertisement for Amazon itself, than a proof-of-concept. First question: "Why am I building this web site?" Are you building the site to make money? To share information? Or to build community, to keep in touch, or other collaborative effort? If you are planning a commercial venture, consider tips on business planning, such as this magazine article. The most basic tool to get started, after your business plan, would be a site map. A site map is a diagram that represents the hierarchical structure of your site. The site will ultimately be rendered in Hypertext Markup Language (HTM), but this blueprint provides guidance on the overall navigation and structure. A site map is a planning aid that maps out the pages and navigation/structure, to help organize and categorize you content so that visitors can achieve the end goal of viewing your site. Of course, you could also just use paper and pencil, which lets you free-think with little up-front learning. Once you'd got your business plan and site map, you should decide if your site can be static (just HTML files) or dynamic (frequent content updates or interactivity, requiring more sophisticated technology such as a content management system (CMS) or actual computer code. If you have relatively static (unchanging) content, the old method of updating an HTML file manually and uploading it to a server may suffice. This low-tech, low-cost approach can get a site launched fairly quickly. if your content needs to be able to be updated regularly (daily, weekly, ad hoc), with different people adding content, or content that is updated automatically through the use of automated tools, a CMS might be the way to go. Another advantage of a CMS -- no need to master HTML. In many organizations, content authors rely on web developers to put the mark-up formatting codes in place to make content web-ready. With a CMS, the content author/owner can access the parts of the site specific to their own content, and publish, often directly to the web site. 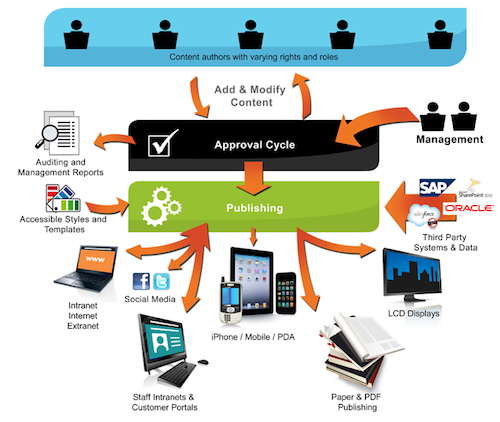 Sometimes workflow is used, to enable third-party review and approval. Finally, a CMS makes applying design standards more simple. With static pages, there is great flexibility, but one often relies on templates to ensure a consistent look across a site. With a CMS, non-authorized users cannot make changes to controlled areas. Virtualization is software that separates physical infrastructure from the servers (or, in some cases, routers) to create various dedicated platform resources. Virtualization software enables a hosting provider run multiple operating systems and multiple applications on the same server at the same time, in partitioned allocations of memory -- making servers, desktop environments, data storage and file systems independent of the physical hardware layer. Cloud computing can be thought of as the service that results from the application of virutalization, when those virtual resources do not require human intervention to be enabled, and are accessed via the internet. The so-called "cloud" is the availability of shared resources, software, or data — as an on-demand service via the Internet. The cloud most often includes virtualization resources to deliver the service or services. The cloud provides a self-service capability, elasticity, automated management, scalability, and pay-as you go service that is not in place with virtualization out-of-the-box. At larger organizations, data center consolidation and modernization might result in so-called "private" clouds. Sofware-as-a-service (SAAS) lets anyone enjoy software applications (such as Workbench "Always on the Job! "©) by licensing user "seats" on that is deployed by a provider, usually delivered in the browser or via a tablet or smart phone. The provider maintains the hardware and software, upgrades facilities and fixes problems -- users' total cost is lowered by eliminating deployment of the application in an organization's data center. SaaS applications are accessed over the Internet. Virtualization is a technology that allows one or more physical server to appear to applications as multiple "logical platforms." These platforms can be accessed via the Internet, with automated tools, making them "Cloud" based.